As of today, dental implants offer patients with missing teeth a permanent solution with multiple oral health benefits.As a comprehensive dental care provider, Dr. Forrest Tower offers both the surgical placement and restoration of dental implants to residents of Oak Lawn and surrounding communities. Dr. Tower has extensive experience with dental implants and provides patients with optimal results utilizing digital imagery to pinpoint the exact placement of the implant. Implant dentistry will not only replace your missing teeth, but will offer you the benefits of long-term functional and cosmetic appeal. 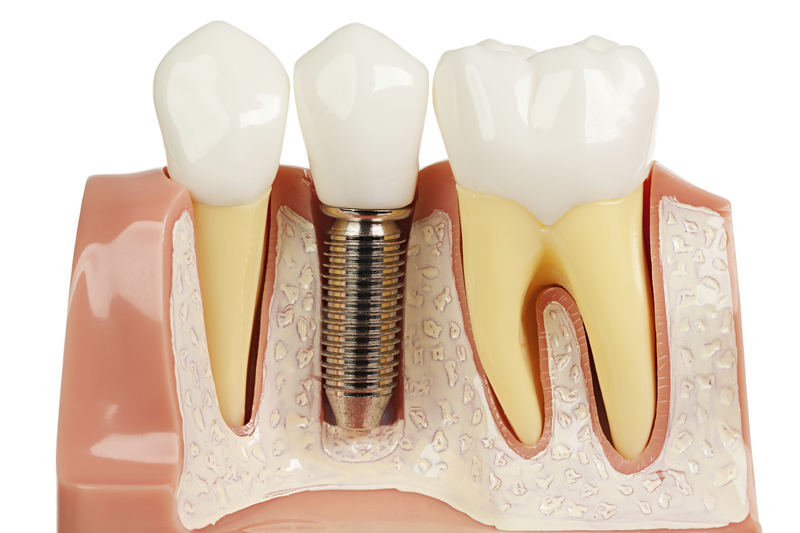 Dental implants are titanium rods that are placed into bone to act as anchor for your prosthetic tooth or teeth. Through a process called osseointegration, the implants will fuse to the bone to simulate the roots of a tooth and provide a strong, durable support for crowns, bridges and dentures. Bone density is examined to determine if patients are good candidates for dental implants. For patients with decreased bone density, Dr. Tower offers bone grafts to help rebuild structure or mini dental implants that require less bone area for placement. Crowns - Crowns cover the entire tooth surface and are designed to restore a tooth to its original size and shape. Porcelain crowns are generally the most popular because they are strong and durable and closely resemble natural teeth. Implant Supported Bridges – These bridges are supported by implants rather than traditional crowns as anchors. Implant supported bridges stand-alone from neighboring teeth, will help improve bone density, and are simple to restore if ever needed. Implant supported Dentures – For full or partial dentures, implant supports give permanence to the structure to end slipping and food restrictions as associated with traditional dentures. Depending on your oral health and bone density, your new denture can be supported by as few as two – four dental implants. Improved Bite - With an appliance like dentures, there is always the risk of slippage, which means you have to be careful with what you eat. Because dental implants are firmly secured into your jaw, you will never have to worry about them moving. Enhanced Bone Density and Appearance – As a result of a missing tooth, the jawbone can recede and neighboring teeth will gradually shift into the open space which can lead to a sunken-in face. The titanium rod acts as a faux tooth root to help keep your jawbone healthy, improve bone density and improve the way you look over time by reducing premature aging associated with missing teeth. Easier Dental Care - A dental implant acts just like a natural tooth, so you will be able to brush and floss just like you always do. If you have missing teeth or are in need of an extraction, contact our implant dentist, Dr. Tower to schedule an appointment and find out more about your missing tooth replacement options. Dental Care Oak Lawn offers both dental implants and mini implants to help you achieve the look you want while protecting your long-term oral health.